*Entrance fee to monkey temple is not included, 20 per person. Enjoy a jungle safari day out as you explore Khao Lak National Park. Many believe this lowland jungle – the wettest spot in Thailand – to be over 160 million years old, making it one of the oldest evergreen tropical forest on the globe. The jungle has dramatic limestone formations and waterfalls that cascade through bright tropical plants drenched with rains and morning dew. This 125 square meter national park received its name after a mountain which has the same name Khao Lak, “Khao” meaning hill in the Thai language. Overgrown rainforest covers mountains and numerous waterfall streams are all around. These picturesque jungles are inhabited by an astonishing diversity of wildlife rare mammals and colorful birds you won’t find anywhere else in the world. It will take almost a whole day to explore Khao Lak National Park. The best way to do discover the park is to ride on top of an elephant, then explore waterways and surrounding nature by Thai traditional bamboo raft. The day starts early with a drive through Phang Nga province passing rubber plantations, small villages and the famous Sarasin bridge joining Phuket and the mainland. 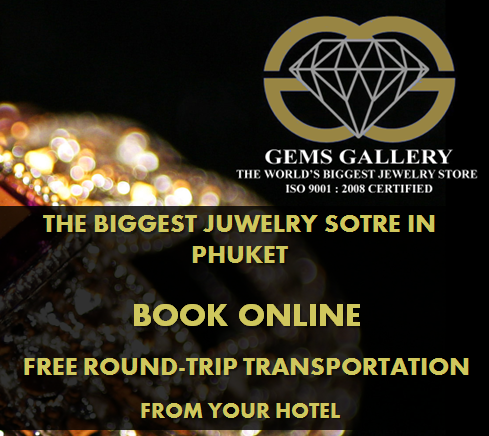 It is about a one-hour drive from Phuket to the first stop of the tour. 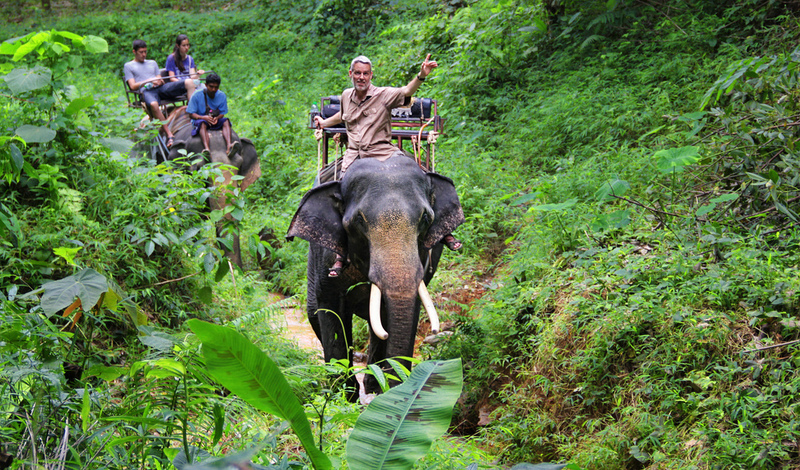 Here, you will take the ride of a lifetime atop an elephant as you explore the jungle. You will trek for approximately forty minutes along elephant trails deep into the valley, with stunning scenery every way you turn. 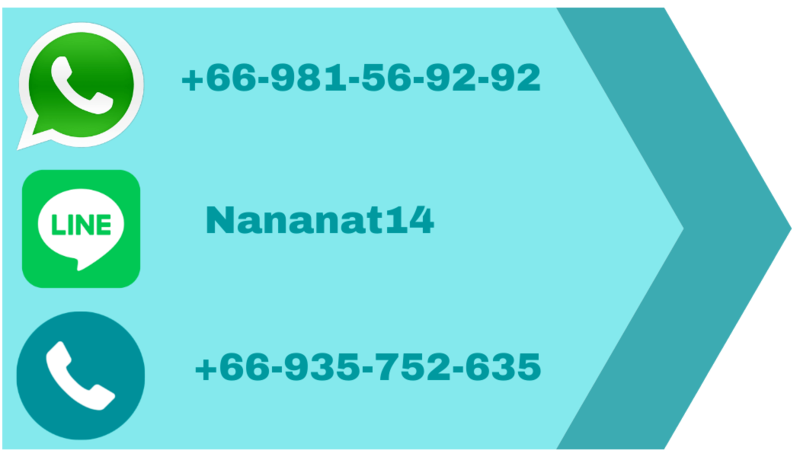 An experienced mahout (elephant keeper and caretaker) will lead the way. Watch carefully how the mahout and the giant elephant communicate with each other, this is a great opportunity to learn more about elephants. Next you will travel to the amazing Suwan Kuha Temple located in a cave of a big limestone mountain. This huge mazelike cave has been a sacred place of worship for hundreds of years and later became the Buddhist temple it is today. 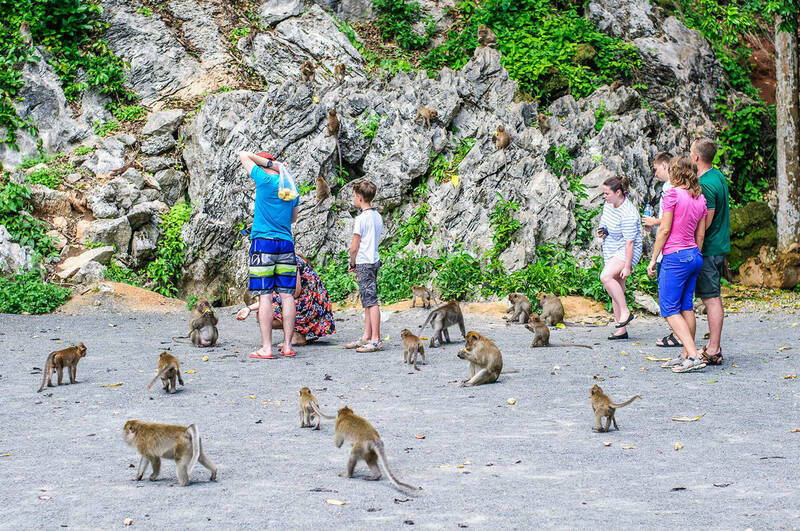 The temple is also known by another name –Monkey Temple – because a huge group of naughty monkeys lives on a top of the same limestone mountain. You will see monkeys all over the mountainous area. Cute as they are, the monkeys are not the highlight you’ll see here. The highlight is a gorgeous statue of a reclining Buddha. The Suwan Kuha Temple still plays a significant role in daily life of local villagers. After observing the temple and feeding monkeys it is time for lunch. The next stop is a Thai traditional lunch at a restaurant with an enchanting view near the river, with food that is worthy of the view. 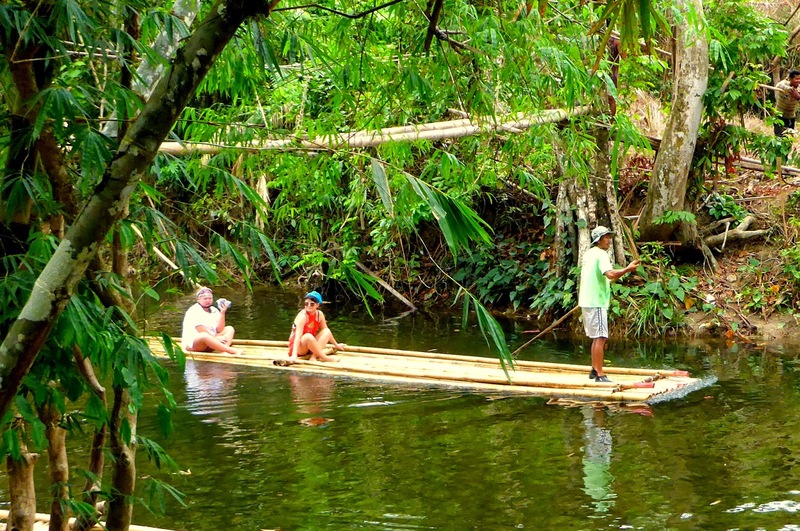 Right after your lunch you will get into your swimsuit and prepare to raft slowly down the river under shadows of giant tropical trees sitting on a bamboo raft. The trip takes approximately one hour. During your raft ride you will see some of the most scenic views in the whole tour. Pull out your camera and be ready to take dozens of memorable shots. The river ride will be a slow and relaxing one, and you will likely not get too wet. However, we still recommend that you to bring second pair of pants or swimming suit as there is a chance your lower half may still get wet. The last stop before we leave Khao Lak National Park is a waterfall. Enjoy the stunning and magnificent beauty of the powerful water, this is a great opportunity to take memorable pictures. Enjoy the view, refresh and stretch your muscles before you are taken back to your hotel. The drive will take approximately one hour. TOUR DURATION: Approximately 10 hours. The day will likely be hot and sunny, so bring sunglasses, a hat and drinking water. And don’t forget your camera! – SHOULD I PAY FOR CHILDREN BELOW 3 YEARS OLD?